Looking for a subletter from Mid-May until end of August. Chance to renew lease after. This is a large master bedroom with a walk in closet and a large bathroom, complete with his and hers sinks. The apartment is shared with a 25 yr old female grad student who is very respectful and clean. She studies a lot so is not in the apartment often. The apartment is updated and in the West Village Moore building - great pool and large outdoor space to enjoy the summer weather. Balcony in the apartment looks over downtown durham. On Sundays the wine bar across the street plays soft Jazz which is just delightful to sit on the balcony or in the living room with the door open and listen to it! Located in the heart of downtown Durham and all its great culture beats! Just steps away from Durham Performing Arts Center, the 21c Museum Hotel, Carolina Theater, American Tobacco, Durham Bulls Stadium, and the popular restaurants that Downtown is known for. Located in the heart of downtown Durham, this light-filled studio features a high ceiling, large windows, two skylights, hardwood floors, original art and an open living plan. There is a washer/dryer and an intercom service connected to the front and back door. (There is not a dishwasher.) A full-size bed within a loft in the apartment and an excellent queen-size sofa bed in the common area (the mattress is very comfortable). A parking pass is included for the lot directly behind the building so no need to worry about finding parking. You really can't beat this location - right in downtown Durham! The studio space is large; we very comfortably slept two with the loft bed and the comfy sleeper sofa. Ellen was very prompt and helpful in her responses, and check in/check out was super easy. This is a delightful place to stay in Durham! I travel to Durham frequently for work and have stayed at Ellen's apartment several times now. Her place is really great in many ways - perfection location in the heart of downtown, unique and eclectic decor, ample natural lighting, spacious apartment, fun loft bed you have to climb up to, the list goes on. I've been very happy with every stay. Furthermore, she's a communicative/thoughtful host, and the place has all the amenities you may need. Super, central, arty studio loft -- perfect downtown location. While the artwork, antiques, high ceilings, and natural lighting make this loft space charming, it is definitely not the cleanest or most well-maintained AirBnB in which I have stayed. The apartment was not dirty enough that I felt I had to call to complain, but it was just grubby enough that I did some cleaning soon after I arrived--dirty handprints on the kitchen cabinets, crumbs on the kitchen counter, food bits in the sink strainer and the refrigerator drawers, used soap in the shower. The loft bed is very comfortable, but the sofa bed is not; it's a classic fold-out mattress (all springs, little padding, loud and lumpy). The loft bed is at the top of a steep ladder, so do note that legit climbing is required. In general, while it has a quirky character, this apartment could use some updating: broken dishwasher, broken disposal, stained shower. But the location is great, close to lots of great restaurants, and the parking pass is a nice benefit. Ellen was easy to communicate with and quick to respond, and check-in and check-out were easy. Ellen greeted me at the door on a rainy evening, and helped me find my way in despite some challenges with a street festival occurring on my day of arrival. Her lovely place was a quiet, restful respite from a busy work trip. Thanks, Ellen! Ellen was wonderful and the loft is a great unique space right in the heart of Durham. The only "negative" feedback I have is that there was no wifi ... she stated that she uses the public wifi, but I was not able to connect to it at all. I believe she's remedying this soon though, so it's probably a non-issue for the next guest. Ellen has such a lovely spot in the center of Downtown Durham. Sun-drenched with big windows and cozy loft. Was the perfect location for my wedding weekend. Only regret is that I couldn't spend more time at the loft. Highly recommend staying at Ellen's place! I would definitely book this place again. Ellen was an amazing host and met us for check-in to explain any details we would need. The apartment was excellent and really unique. The location is in the middle of everything because it is in the heart of downtown. The Trifecta on Morgan Street is a tastefully furnished 2 bedroom home in the trendy and historical Warehouse District of Downtown Durham. Conveniently located for travelers visiting for vacation or work and has everything you'll need to enjoy your stay! You'll love our guest amenities. In addition to free parking, you can enjoy the sparkling pool (April - second week of October), fitness gym, and great location within Durham. Our home is on people’s minds. Save us to a wishlist! The Trifecta on Morgan Street is a charming 2 bedroom, 2 bath rental in the historical Warehouse District of Downtown Durham that includes a fully stocked kitchen, comfortably furnished rooms, and free parking on-site. It's within walking distance to the convention center and Downtown Durham's best restaurants, pubs, and entertainment. You'll love the 18th century architectural roots of the space which features brick, timber, high ceilings, wood floors & an open floor plan. It'll be your home away from home while you explore and experience everything Durham has to offer. We love to give recommendations to our guests so never hesitate to ask us for things to do, places to eat, or sights to see. What you'll really like about staying at our space: • Cleanliness. Our space is professionally cleaned before each and every reservation, while many other listings in the city are not. You'll really appreciate staying at a clean and well taken care of space. • Communication. We have a 100% response rate for a reason. We respond to each and every guest message within just a few minutes, before and during your stay. • Arrival. We have a convenient 24/7 self-check-in system with free on-site parking that lets our guests have flexible check-in times, no matter how late it is at night. • Safety. Our home is located in an apartment community that has security cameras, is well-lit, and has an enclosed garage for private parking. • Location. The location we're in is a walker's paradise since most places you'll want to visit won't require a car. Morgan Street is as flat as a pancake, has ample sidewalk space, and is very bikeable. Our home is just a 5-minute walk away from the Convention Center. Walk Score is 84, Transit Score 65 and Bike Score 80. Everything you need to know about our home: • two spacious bedrooms each with a queen-sized bed • apple tv equipped with Netflix, HBO, Hulu, YouTube and cable in both living room and one of the bedrooms • super fast wifi, perfect for apple tv streaming • two full bathrooms (one with tub, one with standing shower) • walk-in closet that'll hold all your suitcases, travel bags, and clothing • paid washer/dryer down the hallway (not in our unit) • black-out curtains over the large windows • fully stocked kitchen with the essential cookware, silverware, and dinnerware you'll need to dine-in • dining table • spacious living room that includes a queen-sized pull out sofa • laptop friendly workspace Please take a look at the photos in the listing to see our home and feel free to message us with any questions you may have regarding our rental. We typically respond in a few minutes. *Important. We require a photo of our guests' driver's license/state id during their stay. Please do not inquire or instant book if you cannot provide a photo of your driver's license/state id. More information regarding this standard procedure can be found in the "Other things to note" section. Get $40 in travel credit from Airbnb when you register for a new account using our referral link www.airbnb.com/c/abrahami164 This home is owned and operated by Trifecta Corporate Housing, Durham's premier corporate and vacation rental provider. Want to know more about us? Do an online search for Trifecta Corporate Housing and see why travelers choose us for their business and leisure travel needs. Great place! Perfect location for easy walking to lots of great shops and restaurants. Clean and bright space. Firm beds with comfy sheets and amazing pillows. We didn't do any cooking but took note of the full range of spices available - don't see that at every AirBnB. Check in was easy. Expect to park in the garage if you arrive or return in the evening, but its pretty easy to figure out. Thanks for a great stay! We had a great time! The place is so adorable, very clean and well cared for. The building itself is super unique, in a great area, and it was overall a great experience. We would definitely stay again, and recommend it to our friends. Thank you so much! This is a beautiful, stylish and sparkling clean space in a great location. The home has 2 nice sized bedrooms and 2 bathrooms with really nice linens and very comfortable beds and furniture. The location is excellent with restaurants, bars and shopping within walking distance. We will definitely stay here on our next trip to the lovely city of Durham! This apartment is fun and chic (modern industrial) and is in a great location. We loved the area, including the delicious Mexican restaurant yards away. The apartment is spacious and super clean. Definitely makes a trip to Durham more of an adventure. Super cool space in an awesome location. It's walkable to lots of greats bars and restaurants and we had a great visit. Only thing to note is that the space is a loft so the walls of the bedrooms don't extend to the ceiling. This means there's less privacy than you might expect in a typical two bedroom setup. Not a big deal at all if you're staying with someone you know well but it's important to be aware that you can essentially have conversations from bedroom to bedroom so privacy is limited. Not a dealbreaker for us at all though, we'd absolutely stay here again! I love the apartment’s ambience and the way the warehouse was represented in the layout. Nicely decorated. Parking was very convenient and I liked having the car in a parking garage vs surface parking. Great location near Brightleaf Square that I took advantage of! The directions to the apartment and checking were clear, no problems at all. I would definitely stay here again! This one bedroom condo is located a few blocks away from Durham's Central Park's restaurants, breweries and nightlife. The unit is fully furnished and the community features a courtyard with park-like gardens and a salt-water swimming pool. Owner offers flexible short term leases and the unit comes with water, sewer, cable and internet. Convenient to Duke Medical Center, Duke University and all that makes Durham a great place to stay. This place is incredibly clean with very nice furnishings and nicely decorated. It appeared that the flooring and several appliances were fairly new and in great operating condition. The beds were extremely comfortable and linens high quality. Check-in was a breeze and the neighbors quite friendly. We are looking forward to returning to Pearl Mill Flats soon! Cozy room with loft in historic converted warehouse. Visiting Durham for 30 days or longer? My building is a cool converted warehouse located within walking distance of bus and train stations, Duke East Campus, Carolina Theater, Brightleaf Square, Durham Central Park and Farmers Market, YMCA and scads of coffee shops and restaurants. Apartment amenities include: unlimited wifi, full kitchen, huge windows, exposed brick, original wood floors, 14’ ceilings and sprinkler system. The available room is up a short flight of stairs and has a twin bed, bedside table, book shelf, chair and closet. It’s cozy and private. I provide robe, hair dryer, iron and ironing board. The bath is shared. Building amenities include: secure entrance, off street parking (lighted), large community room with kitchen and bathrooms, shaded outdoor seating area, elevators, entrance ramp, and free laundry facilities. I’m happy to help with directions, suggestions and opinions as to what to do and where to go while you’re here. Durham has so much to offer you won’t be disappointed! Check out Livability com 100 best places to live - Durham is #4. Transport from RDU by cab or bus (Website hidden by Airbnb) The free bus route is 3 blocks away. (Website hidden by Airbnb) Uber is available. Whole Foods is 1 mile and an easy walk. Great neighborhood - walkable to downtown, farmer's market, movie theater, coffee shops, Duke east campus walking path, Whole Foods . . .it's great. Melissa a était une super hôte. J'ai vécu dans son appartement pendant un mois pour un stage et elle m'a extrêmement bien accueillie. L'appartement en lui même est génial, très confortable, très chaleureux, impeccablement rangé et décoré, idéalement situé en plein centre de Durham, et très proche de Duke à pieds. Melissa est très facile à vivre, et j'ai aussi beaucoup aimé pouvoir échanger avec elle ! Encore merci ! I stayed at Melissa's for five weeks and enjoyed her hospitality and the great location of the flat. The guest room is small but has a good mattress, and good shelf and storage space. The shared main living space is open plan and very big. I enjoyed staying there, it was a very friendly environment with all the advantages of living in an apartment rather than a hotel room; but naturally has less privacy. I have stayed with Melissa many times and would highly recommend it. Melissa's funky and creative loft was great. The location in Durham couldn't have been better for the music festival we attended. Melissa even had a bike available for my other guest to use since we couldn't bring a second bike. The room was comfortable and spacious for our short stay. We didn't get to interact much with Melissa between all of the festivites. However, if I come back to Durham again next year, I'll be sure to consider Melissa's loft. Melissa has a well-appointed and comfortable space, perfect location for exploring downtown and accessible to Duke. Though I only stayed two nights, she had cleared shelves in the fridge and bathroom so I felt comfortable using the shared spaces. Thanks Melissa! Melissa was a welcoming and friendly host, I truly felt at home in her lovely loft-style spacious apartment. I was in town for my daughter's graduation at Duke and the neighborhood and location was near everything. Restaurants and shopping just a couple of blocks nearby. I would definitely plan to stay at Melissa's place first when coming to visit Durham again. Loved our stay with Melissa. Her apartment is centrally located and it was an easy walk to many restaurants and sights, including the DPAC, downtown, and blue city connector bus. The apartment is beautiful and I really appreciated the coffee and breakfast! Staying with Melissa was very enjoyable. The refurbished loft space is very nice, and it is a pleasure chatting with Melissa. The location is walking distance for buses and downtown. I plan to stay there again! Walk to the Central Park neighborhood, downtown or east campus/ninth street and enjoy views of life-size chess set, fish pond and shuffle board from my second floor condo. There is a queen size bed w/ organic cotton sheets, games, art books, high speed wifi, cable w/ HBO and a full kitchen. Chiminea in the grotto near the pool. It is cozy, artsy and I hope you will feel right at home. This is my home, so please treat it with respect. I have a cat, he WILL NOT be staying with you, but if you very allergic, I'm afraid you will not be comfortable. Walk to Durham Central Park, Rick House, plenty of Neighborhood bars and restaurants, downtown, American Tobacco campus w/ DPAC and DBAP, brightleaf square and Duke East Campus as well as Durham Station and Amtrak station. Rachel was responsive, and checked in with us ahead of time about our arrival. Her place had a cozy living room, a dining area, a nice kitchen, one large bedroom, and a nice bathroom. The sink in the restroom did have a little bit of a drainage issue, but other than that this place was an amazing home base for exploring Durham. Rachel's place was just fantastic. The condo is charming with an absolutely wondrous courtyard, and is in a great location that's close both to Duke and Downtown Durham. It perfectly housed two, and provided just about any amenity you could need. I would stay here again in a heartbeat! Rachel's house was perfectly located for me as I was visiting Duke university for a conference over a weekend. It was waking distance from east campus, from where I could ride the university free shuttle to get to west campus. The house was clean, with all functional equipments. I loved my stay and Rachel was very communicative about everything and helped me figure out questions about the neighborhood, grocery stores by etc. I would definitely stay here when I visit next time. It was a budget and comfortable stay. I highly recommend the place. We really enjoyed the location, close to so many great restaurants and so much to do! Rachel was extremely friendly and quick to respond to all communication! Rachel is a great host--she greeted me at her place and gave me a lot of tips and information about things to do and how to get around in Durham. Her place is nice, and it has everything you need. The location is great, close to cool restaurants and bars, as well as to Duke East Campus. Had a lovely stay here--apartment was cute, clean, and super comfortable. Rachel was a great host, easy to communicate with, friendly, informative and flexible. Rachel was super accommodating to my husband & our little gaggle of pups. The condo has a great vibe w/ lovely mid century modern furniture & a clean aesthetic-- absolutely delightful accommodations. She was super quick with all communication & just as sweet as pie. Thanks again Rachel! We really enjoyed our stay in Durham. This apartment complex has an amazing courtyard - we took advantage of the pool and shuffleboard courts. Rachel was very responsive and easy to work with. We would recommend! Second floor condo with a courtyard view. Condo has a king size bed with a high quality memory foam mattress, WiFi, cable w/ HBO, and fully equipped kitchen. Easy walk to Central Park, Brightleaf Square, Downtown, and Duke East Campus/Ninth Street. Check in after 9pm cannot be guaranteed. Check with owner before booking. This apartment comes fully furnished with living room and bedroom furniture, and kitchen essentials. Kitchen has stove, fridge, dishwasher, microwave, garbage disposal, toaster, blender and coffee maker. Full set of dishes and cooking tools to enjoy during your stay, including pots, pans, baking dishes, muffin tins, and herbs and spices. You will be just a short walk from Durham Central Park (farmers market on Wednesdays and Saturdays) and some of the best food, coffee, and nightlife in Downtown Durham. Great place to stay, centrally located. Good communication, readily available. Bed is very comfortable. Location is great. Place is small, but comfortable. Host was great at responding. I reported to the host in my private comments that the bathroom had a very strong cigarette smoke odor and the air fresheners on the vents in the other 2 rooms were very overwhelming. Hoping he will correct this so others can enjoy the place. Great place in a wonderful location! We felt right at home at David’s place. It was clean, the bed was super comfortable, and we had everything we needed. I recommend staying here and we would stay again if we visit Durham. David was exceptionally helpful, especially in dealing with an item we accidentally left behind. Excellent service, excellent stay. The condo was very clean . The complex was quiet and safe. It is close to Durham historic district and Duke East campus. David was very nice to work with. We enjoyed our stay there. David’s place was very nice. Easy walk to great areas and a nice private apartment. He was very quick with responses and the apartment was very comfortable. This stylish condo is so comfortable, and so close to everything in Durham. This place has everything you need for your getaway. The luxury bedding atop a king size Tempurpedic bed made for a perfect mini-vacation in RDU. My host, David, was very accomodating and so responsive. I will be back for my next visit! Great apartment in a unique and gated complex! Located a block from the happening Rigsbee Avenue scene and a 10 minute walk to The Bull, this homey 2012 house offers immediate access to the best of Durham and a private, quiet space to rest and relax amidst friendly neighbors. The room includes a two twin beds, two large windows, and a closet. And you'll have access to our highly functional open kitchen, a great porch for hanging and private fenced backyard featuring a deck, table, chairs, and firepit. This quiet, private room offers two twin beds total and plenty of natural light. A block from Rigsbee Ave night life and walking distance to downtown This is 2012 house, so everything is functional and up-to-date. Two large windows provide a great deal of natural light to the room, with wooden blinds to block it out when sleeping. We chose simple paint colors which augment the ample natural light, so the space feels very light, open and homey. This focuses the eye toward the eclectic array of art Sarah and I have amassed from our travels around the world. The kitchen is excellently equipped with up-to-date appliances and plenty of space. It's an open floor plan with ample seating in the dining and living areas. We also love our outdoor space and hope you'll make use of it. There's a spacious front porch with rockers and a love seat, a back deck with a table, chairs and a grill for outdoor dining, and a big fenced-in back yard with a fire pit surrounded by seats, big ancient oaks and lots of lovely smaller plants. There's no smoking in the house. You're welcome to smoke outside, just throw away your butts. This is arguably the VERY best location for a stay in Durham. You are surrounded by numerous hip restaurants, bars, music venues, coffee shops, and stores--all within a couple blocks (see Guidebook). Yet the street has a charming residential feel, with lots of huge oak trees towering over new and renovated homes outfitted with porches and decks for outdoor socializing. We're an easy 10-15 minute walk to the heart of downtown and all that it has to offer. And there are plenty of parks, neighborhood streets and the Ellerbe Creek Trail to stroll through. It's the best of both worlds--hip urban living on a quiet leafy street. Mon séjour chez Scott et Sarah était parfait. La maison, très propre et bien équipée, est très bien située, à 10min à pied du centre ville de Durham. On s'y soit chez soi ! Scott est Sarah sont très gentils, leurs conseils ont été d'une grande aide pour faciliter mon installation à Durham. Je conseille vivement leur logement ! Excellent people and a very nice house, located in a very nice place to live, close to Downtown. Had a lovely visit. The room was small and cute. The place was really clean. The bathroom was close by. It was fairly quiet in the neighborhood. It was a fairly short walk to downtown and the farmers' market. Also some cool bars just around the corner. Scott and Sarah were great--they let me borrow a bike, offered tea/coffee and eggs in the morning, and were friendly and welcoming. The neighborhood was really convenient to downtown and seemed like a cool part of town. The house was lovely and the room felt bigger than it looks in the picture. Two cute kitties also live here and were also very welcoming. I enjoyed my visit here a lot! Clean, comfortable and perfectly located. Scott and Sarah were very welcoming and flexible with short notice for scheduling a stay of 6 nights. The location in Durham is great. Cats and dogs were no problem. Everything was very clean and I felt safe. Liked the freedom to participate in the household or to be private depending on my wishes. What great people to meet. The room is very beautiful and comfortable. Thanks very much for Scott and Sarah's kindness and warm hospitality. They treat me as part of their family. I am so lucky to choose to live in this wonderful family. It must be my first choice if I visit Durham in the future. P.S. The dog is very shy and the cats are very cute (Haha). Had a great (Email hidden by Airbnb) fortable space and helpful hosts. Highly recommend a stay here. We are tucked in a quaint, historic condo complex with lots of outdoor space, gardens, grills, picnic tables, shuffle board, and a beautiful pool. Duke's East Campus, the South Ellerbee Creek Trail head, and Durham's popular Brightleaf and Central Park Districts are all a short walk away, including the best coffee, food, beer, + shopping that Durham has to offer. This condo features unique artwork cultivated from ArtHaus’ collective of Durham artists. All pieces are available for purchase. Great neighborhood, close to downtown in one direction and malls, costco and target in the other. Charming condo, as described. Space was comfortable and cozy. Loved the french press and sodas. Beds very comfortable; Really appreciated the toiletries and access to iron. A great place to stay. Perfect if you want to go to points downtown or on campus. 15-20 minute walk to downtown, 15 minute walk to East Campus. Clean, safe place and perfect for 2 people looking to find a nice spot for the weekend. 100% recommend!! LOCATION! This place was set in a wonderful location for many activities in downtown Durham. My husband and I were able to walk everywhere! There is a running/walking trail that begins right outside the unit, the pool is lovely, and we had a great time exploring many bars, restaurants, cafes, and shops all within a few minutes walk. Whole Foods was also just a short walk through Duke University's East Campus. Just lovely. Katie was extremely helpful, answered all of our questions and was very prompt in responding. We were so at ease, it felt as though we were visiting a friend when we showed up to Durham! The whole experience was perfect. The building is secured by a gate which you access with a code for entry. We brought a wagon to easily unpack the car and get our luggage to the first floor unit. The pool is a great amenity and the grounds are beautiful! The condo was clean and fit our needs. We would stay here again. I very much appreciated coffee and sparklingly water in the fridge. The place is clean and well organized, will find everything you need during your stay. Great location for a couple of days of work in Durham. Walkable to all the key destinations downtown! Guests have access to the guest room, guest bathroom, living room area, and kitchen area. There is NO access to the other areas in the house; violation of this rule will be reported to Airbnb. My home is ready to be your home while you travel! You can park right out front as the driveway is circular. The guest room is just upstairs on the left and has a private bathroom. The room has a closet and toiletries are available. Our home is laid back and casual and the guest room is outfitted with super comfy mattresses, and an updated bath with a great shower head and plush towels. This cozy, comfortable downtown poolside condo, Pearl Mill Flats Unit 156 (was Duke Tower) is located near everything in Downtown Durham. It is easily walkable to major attractions, parks, restaurants, and entertainment venues. There are lovely outdoor spaces, comfy beds, and a charming, unique building. The first-floor condo is next to pool, lovely gardens, cookout areas, shuffleboard, and human-sized chessboard. Very close to Duke East Campus and Duke Hospital. Business travelers welcome. The condo is very clean, well-decorated and well-stocked with everything needed for a comfortable stay. Keurig coffee and still and carbonated water are provided. Pearl Mill Flats is within easy walking distance of downtown Durham restaurants and entertainment venues (15 minute walk). My favorite restaurant, Blue Note Grill (great food and live music) is less than two blocks away. Durham Performing Arts Center and the Durham Bulls Baseball Park are about a 2-minute drive or 25-minute walk from Duke Tower. I am a repeat visitor. Great place, great location, clean and comfortable! Clean, comfortable,quiet, nice kitchen, laundry room close by, close to restaurants, and great price for graduation weekend. Location cannot be beat! We walked to downtown every night, and getting around during the day was so easy. Comfortable apartment, instant communication from Robert, and overall a great place to stay. Highly recommended; would book again. I really like the well equipped space Robert provides. I don't do any real cooking while I'm there, but we love the public spaces, including the pool and grounds, and in the evening, I enjoy the cable TV choices including the full array of HBO stations, as well as cable news. I'm able to keep my usual breakfast and lunch foods, and then have dinner out. It really is a great location, in walking distance to Whole Foods and a very well stocked Harris Teeter, plus parks, Duke Gardens and all that the downtown has to offer. A great choice when in Durham! Great little Condo & “neighbors”! Good location. Would definitely recommend! Great place to stay within walking or biking distance in Durham! This fully furnished 1 BR apartment is in a convenient location walking distance to Duke. A few blocks in the other direction is the Durham Farmers' Market, Motorco, Fullsteam, the Blue Note Grill, Cocoa Cinnamon, etc. It overlooks a large garden patio, with a pool and laundry on site. This apartment is on the quiet back side of the courtyard, and is well lit, with beautiful large windows. This apartment comes fully furnished with living room and bedroom furniture, and kitchen essentials. 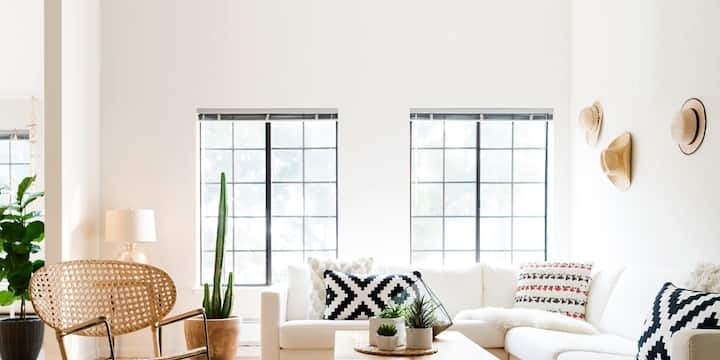 Large windows let in plenty of light when you want it, and thick curtains block it out when you don't. A nest thermostat gives you complete control of the central AC/heating. Kitchen has stove, fridge, dishwasher, microwave, toaster, and coffee maker. There is a desk in the large bedroom (not pictured, just added) for you to work or study. These apartments were built on the site of the old Pearl Mill textile factory using reclaimed brick. The factory tower still stands in the center of the complex. Live in a part of Durham's history! Trinity park is a tree-lined neighbourhood between Duke's East Campus, and Durham's downtown. It's easy walking distance to great BBQ (like the Pit), a brewery (Fullsteam - great beer! ), a farmers market and plenty of other dining, bars and entertainment. There's a quiet park nearby (where I ran cross country in highschool). This is one of my favourite parts of Durham. Very cozy and equipped apartment. It is located in a very quiet complex and is very reachable. Greg and Cathy are excellent hosts. It is a good place to start. It has everything you need. Great place. Close to everything. Lovely complex. Greg’s place was lovely for my time in Durham. Only five minutes from the downtown area by Drive. Perhaps a 20 minute walk. Quiet, and very cozy. The place was very clean and spacious enough for all of my belongings and for me to really feel like I was in a home. All of the Sellitti’s were perfectly and he stocked up on amenities. The perfect place to stay I’m hoping to come back! This spot is great for many reasons: the condo itself is a perfect size and very comfortable, the pool is a fantastic bonus, and there are so many great restaurants nearby. Greg and Cathy were wonderful hosts. I would highly recommend this place and will make an effort to book it again if/when I return to Durham. Greg and Cathy's place is absolutely perfect. The apartment complex is secure and safe, and also comes with a pool, family games in the courtyard, as well as barbecues and benches out side. The apartment itself was homey and extremely clean. Cathy was very helpful with any questions I had and made sure I felt at home. Would recommend this place for a short or long term stay. Thank you both so much for letting me rent out your place it was a wonderful apartment!! My stay at Greg's apartment was great. It was roomy and well-maintained. I would definitely stay here again! The location is wonderful, with about a 10 minute drive to the Duke Hospital. There are also a lot of wonderful restaurants only about a mile away and a farmer’s market is less than a 10 minute walk. The neighbors were quiet and the house was clean. I would stay here again if I was going to be in the area. This cozy updated bungalow comes with full use of the kitchen, dining area and rec room with foosball. Situated in a pleasant and quiet neighborhood 5 minutes walking distance from vibrant downtown Durham. Close to fine restaurants, music, the minor league baseball stadium, concerts, Durham Performing Arts Center (DPAC) and parks. *Private covered parking space, wifi, key-less entry, front door security. The Cleveland-Holloway neighborhood is located at Cleveland Street to Old Five Points and Holloway Street to Alston Avenue. We have a rich history that continues to the present; many residents have lived in our houses for over 50 years. Our diverse neighborhood includes families, single working-class individuals, artists, and musicians. Downtown Durham is vibrant, funky, authentic, diverse and inspired by community. Cedric was accommodating and pleasant to rent from! Cedric’s house is great, comfortable & uniquely decorated. The location is super convenient, very close to downtown. Cedric responded immediately to my queries. Place feels forgotten. Has a lot of potential to be a great place. Hallway light is motion activated and flickers on and off, furniture is outdated and positioned strangely relative to one another. Strange decorations / toys. Cracks in ceiling and walls. Door locks on each bedroom requiring door codes. easy to locate, had a lot of space, it was a very comfy visit, my son loved the foosball table! Cedric's place is conveniently located near Durham. The home is very spacious and great to accommodate larger groups. Checking in and out was a breeze using keypads on the front door. The house itself is old, so expect to see some wear and tear around the home. Clean towels were provided and beds were comfy. One complaint was the shower drain was clogged and drained slowly. Our stay at Cedric's place was wonderful! We were within walking distance of all our favorite shops, restaurants, and breweries, and the place itself was clean and spacious. I definitely recommend this spot if you plan to spend your evening(s) downtown! Cedric's place was great! Super-convenient location and he replied to all of my questions quickly. Well kept, clean, older home in a gentrified area on the east side of downtown Durham. Easily walk-able to downtown Durham including DPAC and DBAP. Alan was a very gracious and attentive host. The apartment is enormous, spacious and comfortable. I felt at home. Alan replenished breakfast foods every day and was very resposive to my needs. Can't beat the location: steps from downtown yet on a quiet street. Definitely recommend to everyone who's passing through Durham! This home is beautiful inside and out. Great location for walking to dining options close to the Bright Leaf area. The host is very responsive and communicative we loved our stay. I would highly recommend this home. Stylish and spacious, it feels like a house unto itself. We found the place very clean and cozy, with tasteful decor. Alan was an incredible host adding a whole extra fully made bed and bedding for two others when I informed him there would be a few more of us staying there for a film festival. He even left us a fairly well stocked fridge! Above and beyond! Great, well appointed place for price and excellent Durham location near food and drink. There’s no reason why you shouldn’t stay here! It’s in a perfect location close to downtown Durham and to the university. Alan was very helpful and respectful to our needs. He went above and beyond to make sure our stay was nothing but the best. We 100% recommend you stay here. We’ll be back! My place is close to family-friendly activities, nightlife, and public transport. You’ll love my place because of the neighborhood, the light, the comfy bed, the kitchen, the coziness. My place is good for couples, solo adventurers, and business travelers. Please add a pin (of where you are traveling from) to the world map on the wall. Pins are in round case on left bottom corner of map. King bed, fully renovated kitchen and bath, comfortable leather couches, fully stocked with plates, glasses, cups, pots, pans & silverware. Just bring your clothes and food. Cute place with everything you need! This is an amazing flat in downtown Durham!! This places great for an escape or just trying to find a place to stay. You are within walking distance of many restaurants and bars. The community it is in is beautiful and as a nice community area. Definitely recommend and would come back! Apartment was great. I would definitely stay here again when I come back to Durham. Wonderful utilization of space. No iron or iron board so bring your own if needed. Great location, walkable to many areas including Duke's East Campus. Great location in downtown Durham a 5-minute walk from Duke's East Campus and a 10-minute walk from central Durham. Great coffee, drinks and food are all within a short walk. There are also supermarkets a short walk away through the pretty green Duke East Campus. We only spent one night here, but wish I could stay longer! It was clean & comfortable with everything we needed. Love the cozy sofa, great host communication, and easy check-in & check out. You might hear a little neighbor noise but the place itself was everything advertised and would definitely stay again. Alex's place is clean and very well located. Everything in the apartment was as we expected. Alex was very responsive and helpful. We enjoyed our time in the apartment. Lovely home in such a convenient area! We were in town for a wedding and were able to walk to most events. The space was much larger than expected as well! We were able to have people over with ease during our stay. Clean, spacious apartment with all the amenities! A did a great job of anticipating all our needs with clear check in and parking instructions. Location was great, A was also very quick to respond to questions! Would recommend and stay again, thank you! A twenty five hundred foot private loft condo in the heart of Historic Downtown Durham. Once, a 1920's era commercial building and now a residential "Development of the Year" award winner! Enjoy the open loft for relaxing, entertaining, and privacy. And, enjoy beautiful sunsets from the rooftop deck. 308 West Main was built by John Sprunt Hill, as were many other buildings in the early 1900's. Post-Civil War Durham was fast growing, largely because of tobacco. John Sprunt Hill returned to his home state with his bride, Annie Louise Watts.....the daughter of one of the founders of American Tobacco Company. Together they helped make Durham a burgeoning, diverse economy. This building remains as one of his creations. Historic renovation was completed in 2008, leaving many of the original design and function elements. The space is large (~2,500 sq ft.) with an open floor plan. Pictures do not do this justice. You'll know that when you experience this one of a kind place. Literally in the middle of Downtown Durham. As the Airbnb website shows, you are only feet from Durham's best dining, entertainment and nightlife. Barry and his home are hands down one of the best finds I ever had on Air Bnb. The quality of housing, amenities, location, and responsiveness from Barry as a host were exceptional, and made our stay in Durham an excellent one. If you are looking to appreciate Durham and all that it has to offer from a cultural perspective, this location will put you right in the heart of it all, with good food, good people, and good vibes. Thank you very much, Barry. Barry’s place was great! Wonderful location! Beautiful place! Clean! Barry was really nice and helpful with details about the area! Would definitely stay there again! This loft is going to blow your mind, it has an attractive industrial look and feel while at the same time gives a warm and welcoming appeal. The location is right in the middle of an revitalized area, which houses several great restaurants and shopping. On top of that Barry is an awesome host, it felt like we had know each other for years, right from the start. Without a doubt a fantastic place to stay if you are ever in the area, highly suggest it! This space is the best Airbnb we’ve ever stayed out. On top of the amazing home, Barry, the host, was fantastic and very flexible with plans. I would recommend this home to anyone and everyone visiting the Chapel Hill area. This place is amazing. What a wonderful space! You will not be disappointed!!! Hosting out of state friends for the weekend, we booked Barry’s space in order to be close to everything downtown Durham has to offer. We quickly realized we just never wanted to leave the space. It is steeped in character, space, warmth and welcome. It will meet and exceed all your needs for a weekend getaway. Communication was prompt and Barry went above and beyond to work with me and made every step of the process as simple and enjoyable as possible! Would certainly stay here again in the future! Amazing place!!! it would be my dream place to live !!!! I highly recommend!!! This spacious industrial styled, 2 bedroom, 1.5 bath loft is situated in the heart of the Durham….. more specifically, the well-desired Historic Warehouse District. Our company provides modern luxury corporate housing accommodations located in exclusive communities of the Triangle. As a guest, you will be afforded the luxuries and conveniences of city-life, while maintaining the peacefulness that is conducive for focus and relaxation. Additionally, our condo includes free onsite parking, and is walking distance to a wide variety of eateries and companies such as: Duke Clinical Research Institute, Durham Convention Center, and Brightleaf Square. It also provides easy access to Durham Freeway, Duke Hospital, and Durham VA Medical Center. What makes us great: -Cleanliness- We guarantee a professional and thorough cleaning after EACH and EVERY guest. -Safety- Our loft is located in a gated community with security cameras, and a well-lit parking deck.] -Location- Because of its location, almost everything is walking distance. So having a car is not necessary. -Communication- We guarantee prompt responses to all messages from our guests. What is included: •Keyless Entry into home •Dining table with 4 chairs •Fully equipped kitchen (with essential cookware, utensils, dinnerware, and coffee station) •4K Smart TV with built in Roku and equipped with Netflix and Hulu •High speed Wifi •2 fully furnished bedrooms with queen size beds (personal workspaces included in each room) •Home essentials (ironing equipment, fire extinguishers, first aid kit) •1-1/2 bathrooms (with hair dryer, and soap, bodywash/shampoo/conditioner dispenser) •Paid washer and dryer on 2nd floor (shared with other tenants) FAQs: No parties. Absolutely no pets in residence. Prior to confirming your booking, you must agree to send a photo of your State ID/Driver's License through Airbnb's secure messaging service once the reservation is confirmed. This is part of our standard House Rules. If a State ID is not sent within 12 hours of the booking confirmation, the reservation will be canceled. We will hold onto the photo of your ID for the duration of your reservation. Immediately following your stay, your information will be safely disregarded. Why do we need this? This information is also required by our apartment staff for identification and general security purposes. This request is standard for all corporate and short-term guests with our company, but if you do have any questions please feel free contact us or Airbnb client services for more information. Lastly, please do not book if you are unable to provide a photo of your State ID/Driver's License. Thank you for understanding, and again, if you have any questions about any of our house rules please contact us. 2 Bedrooms, 1 Bath, only 1 mile from DPAC, 1.5 miles to Duke East Campus, 3 miles to Duke and the VA Hospitals. Two blocks from MotorCo, Fullstream and Durty Bull Breweries, The Pit Restaurant, Geer Street Garden, Cocoa Cinnamon and other downtown hot spots. Short walk to Durham Central Park, Farmers Market, YMCA, Restaurants, and much more! Open floor plan, includes granite counter-tops electric range, refrigerator, central heat and air, on-site laundry and parking. The unit was recently totally renovated, it’s well equipped with new stainless steel kitchen appliances and beautifully furnished. The living room and kitchen has an open concept. There is a four seat dining table in the spacious but cozy well equipped kitchen. The accommodations for this unit comprises of two bedrooms one full bath. One room has a queen bed and the other has two twin beds. The sofa in the living room converts into a bed. The living room a 40 inch smart TV which is connected to cable and Roku. There is also free wireless internet throughout the unit. There is onsite parking along with a laundry room and a large deck at the front of the property. The unit is walk-able to the City Center, Durham Central Park, American Tobacco and more! The Pit BBQ restaurant, Motorco, Fullsteam Brewery, Durty Bull Brewing Company, Coco Cinnamon and Geer Street Garden are only a 3-5 minute walk from the unit. We stayed almost for a week at this property, while we were dropping our son at Duke. Highly recommended place. Very neat and clean. All things thoughtfully planned. Dewitt is quick with his replies. Overall very nice stay. Dewitt's apartment is very clean, pictures are very accurate and located in a quiet residential neighborhood. The apartment is 2 blocks away from a corner with an excellent local coffee shop, several restaurants, several neighborhood bars, sometimes food trucks, nice local craft store. Several parks are within walking distance. The apartment is on 2nd floor from street, 2 stories walk-up from parking lot. Nice place to stay in Durham, Dewitt responded to questions very quickly. Thanks for pleasant stay. Cozy place, close to all of the breweries and restaurants. Downtown, Dpac, Bulls stadium, Duke campus and hospital, are only a short ride away. It was a great stay. Apartment came stocked with goodies and everything one would need. Absolutely no complaints whatsoever. This apartment was incredibly clean and close to everything. Really fun area and only 1 block walk to Cocoa Cinnamon, Parts & Labor, Blue Note Grill, Fullsteam Brewery, and Durty Bull Brewing which has an N64 that you can play while enjoying a pint. The unit had all of the spices, pots and pans, and cooking utensils that you would need to prepare a meal. We would definitely stay here again! Fantastic space in a great location. Would love to stay here again! Great spot with easy bus access! Very close to Fullsteam, Motorco, and Cocoa Cinnamon- all great spots. I very much enjoyed my time. Great small apartment in Durham! One bedroom, one bath condo in the heart of Downtown Durham with an interior courtyard that will ease all your tension. Enjoy the salt water pool or sit and enjoy the chirping of the birds, you wont believe you are in the city! Great apartment in gated community! Great place in a wonderful location! Tons of space for two guests with many wonderful bars and restaurants within walking distance. The bed is extremely comfortable!! I had a great stay at Jody and Emilee's place. As stated in the description, it's a pretty simple apartment but it was clean and comfortable. The bed was super comfy, which was nice. Check-in was easy and they were quick to respond to messages. Great location. Close to downtown. The apartment is comfortable, convenient and located a 10-minute walk from nice shopping and dining areas. The laundry facility for the apartment complex is comfortable and easy to use (takes quarters, no change machine). I believe it would be especially pleasant in spring, summer and fall when the beautiful courtyard and pool area look to be quite magical! Very clean and only a few blocks from venues and food. Nice quiet complex. New 2 bedroom apartment, built above new garage on alley in Trinity Park. Modern and open, lots of light, maple floors and a real cook's kitchen. 2 blocks to Duke's East Campus, 5 blocks to downtown Durham. Owners live in house across back yard. John was incredibly helpful throughout the booking and check in process. He was very hospitable while respecting our space- a perfect air b&b host! The location was as explained- walking distance from great dining and activities, as well as nearby Duke. They did a great job with the space. Perfect for our family of three to enjoy. We were so glad to return to John's airbnb! Clean, bright, and nicely appointed. Very kid friendly. We really enjoyed our stay. The apartment is spacious, new, and well-appointed. The location is superb - the immediate vicinity is quiet and relaxed, but Brightleaf is just a couple of blocks away and downtown ia not far at all. Parking is right outside the unit. There was only space for one car. The area fits two, but the owner parked one of their cars there as well. The only oddity I'd note is that the west-facing windows lacked coverings. They face onto the roof of a neighboring building so privacy is not a concern, but it does make it hard to keep light out of the second bedroom. I'm sure you'll enjoy your stay in John and Laura's alley apartment; it's new construction. You'll find everything you need -- a washer/dryer, full-kitchen, and frosty cold AC. Perfect place to stay. Great location! Loved that there are books for all ages... Which gave me the chance to read with my 5 year old nephew who is learning to read! Very nice hosts! Thank you! This place is absolutely gorgeous! And John and his family are just wonderful hosts. ANYONE playing DPAC this is the perfect home away from home while on tour. It’s about a 15 minute walk to the theater though a lovely neighborhood full of coffee shops, yoga, and Restaurants. The apartment house 3 actresses comfortably with one taking the pull out couch in the living area. The only thing we wish is that we were playing DPAC for one more week so we could enjoy the beautiful apartment for another week. Also John and his family came to see us in our show talk about SUPPORT. Just an absolutely dreamy Airbnb for anyone looking for the comforts of home and a beautiful kitchen. Back Alley Apartment, walk Downtown and Duke. * 3BR, 2.5BA, sleeps 8, easy parking, fast wifi, smart TV, Netflix, coffee, well app'd kitchen * Fantastic d'town location: 2 blocks to great restaurants, bars, kids park, and coffee shops. * Yoga and Crossfit are less than a block away (details below - “Places to try…”). * Further south on Foster Street (3m car/10m walk) is Durham’s Central Park & skate park, a YMCA, the Carolina Theatre, and the Durham conven. center. What our guests have enjoyed about our unit: - *Cleanliness* Our professional cleaners clean before every reservation; our guests have appreciated the cleanliness. - *Location* Coffee, fitness, parks, restaurants, bars, distilleries, rental bikes, convenience stores, etc. are within a 2-block walk with many more amenities a few blocks more. - *Communication* We have a 100% response rate and strive to respond quickly and thoroughly, and we provide an electronic house manual that you can access/use from your phone, which has all relevant house information in it. - *Self check-in and out* We have a convenient 24/7 self check-in and out system with free parking, steps from the front of the townhouse, that our guests rate highly. - *Furnishings* Guests have appreciated the furnishings, little “touches” throughout, and well appointed kitchen (glassware, dishware, mugs, flatware, cooking utensils, cookware, baking sheet, etc.). Our home is ready for you. We offer our guests essentials like: - Freshly laundered bath towels, bed sheets, hairdryers, iron, & ironing board - Toiletries like hand soap, shampoo, and conditioner - Sleeping essentials like bed linens, 4 pillows per bed, and extra blankets - Essential cookware, utensils, silverware, glassware, and dinnerware - Coffee and coffee maker, cream and sugar - Two tables downstairs for dining and also great for laptops - Free washer and clothes dryer in unit - Roku TV with Netflix and various free content via Roku and local channels - Fast wifi (130MB/sec+ typically) Sleeping Arrangements: - Master bedroom has queen bed with en-suite bathroom - Second and third bedrooms: one has queen bed and 2nd has queen-sized, intercoil-mattress futon - Fourth bed is a sofabed in main living room, which has a 2” memory foam topper - All beds have 4 pillows: 2 soft, 2 firm Please note: all bedrooms and bathtub/showers are on the 2nd floor, accessible only via stairs. Parking: You can park directly in front of the front door of the townhouse as well as the parking space to the left of the first parking space (when facing unit). You’ll have access to the back fenced yard, and can use the large trash and recycling cans to the right of the property for extra trash and recycling. We are just blocks (3min by car, 10min on foot) from additional restaurants (Thai, Indian, others) /shops off Main St & Brightleaf Square, where a free Connector bus can take you to Duke campus. We are a 4-minute drive to Duke’s east campus and 8 minutes to Duke’s west campus, Whole Foods, and the Durham Bulls baseball park. The Durham Performing Arts Center and the Durham Hotel and rooftop bar with scenic vistas are also nearby. The building is set back from the street & has 2 parking spaces in front. It sleeps 8 with 3 bedrooms and 2.5 baths. Places to try within 2 blocks: Durham’s revered Cocoa Cinnamon coffee shop is 2 doors down (cocoacinnamon.com) and shares a corner with Yoga (http://www.bluepointyoga.com/ drop in program and costs: https://bluepointyoga.com/pricing) and Crossfit Durham (crossfitdurham.com - drop in program and costs: https://www.crossfitdurham.com/drop-in/). Across the street is Geer Street Garden, which has a great rustic tented/heated outdoor area. We are one block from Blue Note Grill hickory-smoked BBQ and nightly American roots music (thebluenotegrill.com) and an award winning craft Gin distillery, Durham Distillery (durhamdistillery.com) with tours/tastings Friday/Saturday (see schedule). Two blocks from unit are: Fullsteam brewpub (fullsteam.ag); MotorCo, music, indie bands, standup comedy, food (motorcomusic.com); Hutchins Garage restaurant & bar (https://www.facebook.com/Hutchins-Garage-1791896040902139/); Accordion Club pub (https://www.facebook.com/accordionclubdurham/); and The Pit Durham, BBQ (thepit-durham.com) “Food truck rodeo” is set to occur south on Foster street at Central Park (by skate park) several Sundays in 2019: 1/27, 3/24, 6/16, 9/1, 11/3 (https://durhamcentralpark.org/events/food-truck-rodeo-info/) Most guests find everything they want or need just steps away from our townhouse. After a long day or late night in downtown, you can come back and relax in our quaint space, meant to make you feel right at home. Wonderful place accessible to downtown Durham. Spacious with nice kitchen. 4 adults were very comfortable. Sparkling clean! Matt and Amy have done a great job! Nice place only a few blocks from great bars and restaurants. Recommend the pit for dinner. Hotel Amenities in Homestyle Comfort Matt & Amy’s home is everything you need plus more. The house was spotless, and there were thoughtful touches throughout. The home is fully furnished with just about anything and everything you would need while away. Our only regret was we weren’t there long enough to use the home to its full potential. : ) Logistics - very easy and timely communications with Matt & Amy. They provide a very thorough pre-brief of the home via word document that answers most of the questions you might have. Area - It was very easy to get to, and in a great location. We were able to walk just a few hundred feet down to the corner and have a really lovely cup of coffee at the recommended coffee shop. (But, they also had coffee in the house if coffee shops aren’t your thing.) Amenities - I say hotel amenities because they have thought of everything. The linens and toiletries were plentiful. I’ve stayed in homes where there was one roll of toilet paper. Not the case here. Every need was met. The kitchen is also furnished with plenty of supplies for cooking your own meals (dish ware, silverware, cups, mixing bowls, pots and pans, etc.) If you’re looking for a great place that still carries the comforts of home away from home, this is the place. Matt and Amy are amazing hosts! Not only were they extremely responsive when we needed a place to stay on short notice, they went out of their way to ensure that our stay would be exceptional. Highly, HIGHLY recommended!!! very walkable, next to some great coffee and lunch spots! Great place in a great location. I would stay here again. I was getting married downtown and was looking for a space as “home base” for myself and the bridesmaids. Matt and Amy’s spot was so convenient and less than a block from everything! They were incredibly thoughtful and left a bottle of wine for us to enjoy, not to mention all the amenities of a hotel at the ready. There were board games and Netflix, great wi fi, a cute little backyard area, full kitchen, absolutely everything we needed. Matt and Amy were super communicative and responsive to questions - we all kept talking about how we want to rent this again. Highly recommend!!! Matt and Amy's home was fantastic. You cannot beat the location, close to everything you want. Would definitely stay there again! Welcome to the best spot in Durham! Just one block from Fullsteam Brewery, Motorco Music hall, the Farmers Market,Cocoa Cinnamon coffee, yoga, restaurants and bars! Rigsby street is the coolest spot in downtown Durham with lots of local bars and restaurants. Walk just 5 blocks to Main Street downtown where you'll find more music venues, some of the best restaurants in NC and more watering holes! Also nearby you'll find the YMCA and Central Park. ONE BLOCK FROM MOOGFEST MAIN STAGE! My home is comfortable and always clean! You'll have access to two bedrooms, each with a queen bed as well as a blowup mattress for extra guests. The kitchen and living room are yours to feel at home in. You really can't get a spot closer to the Durham action! Looking for a Moogfest pad? You'll be one block from the main stage! Please note my cat lives in the home with me, if you are allergic this is probably not a good fit. Fantastic house! Close walking to great coffee & everything Dowtown Durham! Bliss was very helpful & communicative, responding instantly to all my questions. Highly recommended! Great stay! The house is so big, and Bliss was a very responsive host. Located a block from the happening Rigsbee Avenue scene and a 10 minute walk to The Bull, this homey 2012 house offers immediate access to the best of Durham and a private, quiet space to rest and relax amidst friendly neighbors. This spacious room includes a queen bed, two large windows looking out on the backyard, and a big closet. And you'll have access to our highly functional open kitchen, a great porch for hanging and private fenced backyard featuring a deck, table, chairs, and firepit. Your room includes a comfortable queen bed, a large closet, a chair, and a luggage rack. Two large windows provide a great deal of natural light to the room, with blackout curtains to block it out for sleeping. We chose simple paint colors which augment the ample natural light, so the space feels very light, open and homey. This focuses the eye toward the eclectic array of art Sarah and I have amassed from our travels around the world. The kitchen is excellently equipped with up-to-date appliances and plenty of space. It's an open floor plan with ample seating in the dining and living areas. We also love our outdoor space and hope you'll make use of it. There's a spacious front porch with rockers and a love seat, a back deck with a table, chairs and a grill for outdoor dining, and a big fenced-in back yard with a fire pit surrounded by seats, big ancient oaks and lots of lovely smaller plants. Great place to stay for my weekend in Durham and I would definitely stay here again! The location is wonderful and close to an area of restaurants and the Durham Central Park where there is a Saturday farmer’s market. Scott and Sarah’s place is quiet, clean, and comfortable! Beautiful home in an ideal location to downtown Durham. Great location in cute residential area and so close to everything downtown. Communication was on point and the house itself is beautiful, clean and cozy. The Trifecta on Morgan Street is a charming 2 bedroom, 1.5 bath rental in the historical Warehouse District of Downtown Durham that includes a fully stocked kitchen, comfortably furnished rooms, and free parking on-site. It's within walking distance to the convention center and Downtown Durham's best restaurants, pubs, and entertainment. You'll love the 18th century architectural roots of the space which features brick, timber, high ceilings, wood floors & an open floor plan. It'll be your home away from home while you explore and experience everything Durham has to offer. We love to give recommendations to our guests so never hesitate to ask us for things to do, places to eat, or sights to see. What you'll really like about staying at our space: • Cleanliness. Our space is professionally cleaned before each and every reservation, while many other listings in the city are not. You'll really appreciate staying at a clean and well taken care of space. • Communication. We have a 100% response rate for a reason. We respond to each and every guest message within just a few minutes, before and during your stay. • Arrival. We have a convenient 24/7 self-check-in system with free on-site parking that lets our guests have flexible check-in times, no matter how late it is at night. • Safety. Our home is located in an apartment community that has security cameras, is well-lit, and has an enclosed garage for private parking. • Location. The location we're in is a walker's paradise since most places you'll want to visit won't require a car. Morgan Street is as flat as a pancake, has ample sidewalk space, and is very bikeable. Our home is just a 5-minute walk away from the Convention Center. Walk Score is 84, Transit Score 65 and Bike Score 80. Everything you need to know about our home: • two spacious bedrooms each with a queen-sized bed • apple tv equipped with Netflix, HBO, Hulu, YouTube and cable in living room • super fast wifi, perfect for apple tv streaming • 1.5 bathrooms (one full bath, one half bath) • walk-in closet that'll hold all your suitcases, travel bags, and clothing • paid washer/dryer on the 2nd floor the hallway (not in our unit, shared with other residents) • black-out curtains over the large windows • fully stocked kitchen with the essential cookware, silverware, and dinnerware you'll need to dine-in • dining table • spacious living room that includes a queen-sized pull out sofa • laptop friendly workspace Please take a look at the photos in the listing to see our home and feel free to message us with any questions you may have regarding our rental. We typically respond in a few minutes. *Important. We require a photo of our guests' driver's license/state id during their stay. Please do not inquire or instant book if you cannot provide a photo of your driver's license/state id. More information regarding this standard procedure can be found in the "Other things to note" section. Get $40 in travel credit from Airbnb when you register for a new account using our referral link www.airbnb.com/c/abrahami164 This home is owned and operated by Trifecta Corporate Housing, Durham's premier corporate and vacation rental provider. Want to know more about us? Do an online search for Trifecta Corporate Housing and see why travelers choose us for their business and leisure travel needs. Nice place in great location with extremely clear and fast communication. This was a spacious and bright loft, and it was very clean. It was a great location that was walking distance from the performing arts center as well as many restaurants and bars. We enjoyed our stay very much! Abraham & Reem are stellar hosts! They responded quickly to all my questions and made check in and check out as easy as possible. Their space was clean, spacious, and well decorated, so it truly felt like a home away from home. My family and I truly enjoyed our stay and would recommend their home to anyone looking to spend time in Durham. Such a cute apartment in a great location! Abraham and Reem were very helpful and responsive. The whole experience was easy and comfortable. Would definitely stay there again! A beautiful, spacious, and comfortable. Hosts were very quick to respond to any questions. I would definitely come back again. A beautiful old home! A large living room, huge kitchen and a bedroom set up just for you! Please note I live here with my very well behaved cat and dog. Because we are in the middle of Downtown it can get a little noisy on weekend nights. We are less than a block from bars, restaurants, breweries and a music venue. You can also walk to the farmers market Saturday morning! Please note because we are in downtown, there is some noise at night on the weekends. The host canceled this reservation 72 days before arrival. This is an automated posting. Even though it was only one night I enjoyed my stay at this location. Bliss was very friendly and she kept the lines of communication open at all times. She had a very friendly dog and I think a cat as well. Bliss introduced me to her friends who seemed very cool. There was a lot of stuff going on in Durham that weekend. Durham is a busy place. Her spot is a great place to crash for a night or more because she lives in a neighborhood close to all of the happenings and Downtown Durham. Bliss's house was a nice space with wood floors and transom doorways. Decorations and furniture take a less is more approach, but it was a very inviting space with an artistic vibe. Bliss was extremely responsive every time I reached out to her and was very accommodating with a late check-in time and extending our stay by a day. My first experience with a shared-space AirBnb, and no complaints at all. Thanks Bliss. A great room with a lovely host! The bed was super comfy and the location is amazing! Traveling to Durham for business? Need an exclusive corporate sanctuary to work and relax? This stunning historic top-floor studio loft has a phenomenal skyline view, and is only steps away from DPAC! Our company provides modern luxury corporate housing accommodations located in exclusive communities of the Triangle. As a guest, you will be afforded the luxuries and conveniences of city-life, while maintaining the peacefulness that is conducive for focus and relaxation. Additionally, our condo includes available parking in the deck (free after 7pm and on weekends), and is walking distance to a wide variety of eateries and companies such as: Duke Clinical Research Institute, Durham Convention Center, Durham Bulls Athletic Park. It also provides easy access to a variety of tech Companies, Durham Freeway, Duke Hospital, and Durham VA Medical Center. We are very familiar with Durham, so if you need recommendations on things to do and places to eat, we are more than happy to make suggestions. What makes us great: - Cleanliness- We guarantee a professional and thorough cleaning after EACH and EVERY guest. - Safety- Our loft is located in a gated community with security cameras, and a well-lit parking deck.] - Location- Because of its location, almost everything is walking distance. So, having a car is not necessary. - Communication- We guarantee prompt responses to all messages from our guests. What is included: • Secured entry into home • Dining area with 2 chairs • Fully equipped kitchen (with essential cookware, utensils, dinnerware, and coffee station) • 4K Smart TV with built in Roku and equipped with Netflix and Hulu • High speed Wifi • Fully furnished bed area with a queen size bed • Fully furnished living room • Home essentials (ironing equipment, fire extinguishers, first aid kit) • 1 bathroom (with hair dryer, and soap, body wash/shampoo/conditioner dispenser) • Washer and dryer FAQs: Prior to confirming your booking, you must agree to send a photo of your State ID/Driver's License through Airbnb's secure messaging service once the reservation is confirmed. This is part of our standard House Rules. If a State ID is not sent within 12 hours of the booking confirmation, the reservation will be canceled. We will hold onto the photo of your ID for the duration of your reservation. Immediately following your stay, your information will be safely disregarded. Why do we need this? This information is also required by our condominium community for identification and general security purposes. This request is standard for all corporate and short-term guests with our company, but if you do have any questions please feel free contact us or Airbnb client services for more information. Lastly, please do not inquire or book if you are unable to provide a photo of your State ID/Driver's License. Thank you for understanding, and again, if you have any questions about any of our house rules please contact us. Located a block from the happening Rigsbee Avenue scene and a 10 minute walk to The Bull, this homey house offers immediate access to the best of Durham and a private, quiet space to rest and relax amidst friendly neighbors. This spacious private suite includes a queen bed, a sitting area, walk-in closet, and a huge bathroom. And you'll have access to our highly functional open kitchen, a great porch for hanging and private fenced backyard featuring a deck, table, chairs, and firepit. The master's suite occupies the entire 2nd floor so it's very private and quiet. The bathroom is very roomy, with double vanity sinks and a jetted soaker tub. We have two water heaters, so there's always plenty of hot water. This is a newish house, so no need to worry about everything functioning properly. We chose simple paint colors which augment the ample natural light, so the space feels very light, open and homey. This focuses the eye toward the eclectic array of art Sarah and I have amassed from our travels around the world. The kitchen is excellently equipped with brand up-to-date appliances and plenty of space. It's an open floor plan with ample seating in the dining and living areas. We also love our outdoor space. There's a spacious front porch with rockers and a love seat, a back deck with a table, chairs and a grill for outdoor dining, and a big fenced in back yard with a fire pit surrounded by seats, big ancient oaks and lots of lovely smaller plants. Scott’s master suite was very clean and nice. Even sharing the house with a woman and her child, we felt like we had the place to ourselves. The backyard was extremely helpful with our dog. The location was perfect, nice community, walking distance to multiple dog friendly breweries/bars. I think the price was a little high for a shared house with few amenities but the location made up for it. Scott and Sarah's place is great. Scott was very responsive and helpful in advance of my stay, giving me some advice regarding public transportation. The house itself is very comfortable, clean, well maintained, and is in a tremendous location, just two blocks from "new" downtown Durham. Their roommate Sarah could not have been more welcoming, and she and her friends were very fun to hang out with. If you are staying in the master suite, you must like/love cats - they are accustomed to sleeping in that room. I loved staying in this beautiful home. Very comfortable and close to everything. My friend Erik and I stayed for what was my second time! We had a great stay, the house was very peaceful and the transition into the house was seamless and well thought-out. We enjoyed relaxing in the common spaces and the great neighborhood location, especially the easy walk to Cocoa Cinnamon and Fullsteam. I hope to return many times in the future! My stay at Scott's home couldn't have been better. The room itself is spacious & nicely designed, the bed is very comfortable, & the bathroom conveniently attached to the room had ample space & great shower pressure. The cats are very friendly & lovable, welcoming me right when I arrived. :). I felt right at home there. Even though Scott was away, he was quite helpful (as was his roommate who is awesome!). The house is in a great area & close to everything I needed. I think this might be THE most comfortable bed I've ever slept in. The bedroom and house was very clean and had a warm welcoming feel. It's located within 5 minutes walking distance to some great local cafes, restaurants and bars. Thanks for offering such a nice home away from home! Beautiful house, perfect Durham location. Could not have asked for anything more. Beautifully renovated first floor condo with lots of light and a fresh, cheerful look. Well equipped kitchen with granite counter-tops. Ample storage space, including wall-to-wall bedroom closets. Lots of flowers and trees in the giant, quiet courtyard, with a large pool at the far end. Easy 3-block walk to both Duke East Campus and downtown restaurants and entertainment. Utilities included. Free Internet, secure WiFi, cable, wide-screen TV, and DVR. It's in the quietest part of the complex and looks out onto flowers, trees and a grape arbor. The beautiful kitchen and bathroom have been completely redesigned and updated. There's lots of storage space, including ceiling-height kitchen cabinets, a full pantry, a large linen closet, and wall-to-wall bedroom closets. Coin operated laundry on site. Located in historic Pearl Mill Flats. Longer term stays are available upon request. These condos are located in the Trinity Park neighborhood, half-way between the Duke East Campus and downtown. It's a very nice neighborhood with many beautiful, well-maintained old houses. The Ellerbee Creek hiking trail starts just across Trinity Ave by the old railroad bridge, and Duke East Campus has a wonderful hiking/running trail just inside the stone walls all the way around its perimeter. Whole Foods is right on the other side of the campus. Amazing! Ten out of seven stars! An amazing deal for a great price! The accommodation is within walking distance of Duke's east campus and is also very close to the American Tobacco campus/ Brightleaf square. Duke Towers is in a serene and quiet neighborhood so you cant really go wrong with that. The apartment itself was amazing! Spotlessly clean (literally, we tried looking for dirt; zilch), amazing decor, smelt wonderful, had impressive renovations and was fully stocked with linen, utensils, cleaning supplies, etc. Farley was also an amazing host! He showed me around the apartment and made sure I knew where everything was. I definitely recommend staying here. It's really a great value and even better than some pricier hotels I've seen. Besides you can cook your own meals here. Will definitely be coming back! We enjoyed our stay at this lovely condo. The location was perfect ---- walking distance to downtown and the nature trail. The condo is well appointed and very clean. Farley the owner is very gracious host. Place was very clean and well-stocked with towels, sheets, and bathroom and kitchen supplies and amenities. Farley was extremely helpful and we had excellent communication. I'd happily stay here again! Farley’s condo was great! The condo is in a great location within walking distance to many great restaurants, had everything we could possibly need and was within the cutest courtyard. The condo itself was well stocked and incredibly clean. Farley was a great host giving us tons of tips on fun local restaurants and activities and he was always very quick to respond if we needed something. I would stay here again without a doubt. Great location and Farley’s apartment had everything you could need. Farley has created such a lovely, stylish and immaculate place to stay while in Durham. Everything is well thought out and very nicely stocked. Farley was kind enough to greet me a little earlier than check-in so I could get settled in and recover from a long flight. He provided a thorough tour of the apartment and then we chatted about local places to eat and things to do. Super nice guy and a top notch host! The complex is a little retreat from the hustle and bustle of the city, with a lovely pool and pretty courtyard. Farley's apartment is at the far end, away from the pool area so it was pretty quiet. Walking distance to lots of great restaurants and breweries plus American Tobacco Historic District, Brightleaf and lots more. Highly recommended! A comfortable, clean, and secure unit in a great neighborhood close to downtown and other destinations. Host is communicative and friendly. Highly recommended! Farley is a wonderful host and his apartment is an amazing value. We stayed there while we were dropping our son at Duke, and based on our great experience, we hope to be able to stay at Farley's place whenever we visit over the next four years! The apartment is IMMACULATE, has great furniture, brand new appliances, a comfy bed, a smart TV, and anything else you could ask for. We were very comfortable there over a long weekend and felt happy every time we opened the door. Thanks, Farley, for making our experience so great and for everything you've done to make your guests feel welcome in Durham. The Trifecta on Morgan Street is a charming 2 bedroom, 1 bath rental in the historical Warehouse District of Downtown Durham that includes a fully stocked kitchen, comfortably furnished rooms, and free parking on-site. It's within walking distance to the convention center and Downtown Durham's best restaurants, pubs, and entertainment. You'll love the 18th century architectural roots of the space which features brick, timber, high ceilings, wood floors & an open floor plan. It'll be your home away from home while you explore and experience everything Durham has to offer. We love to give recommendations to our guests so never hesitate to ask us for things to do, places to eat, or sights to see. What you'll really like about staying at our space: • Cleanliness. Our space is professionally cleaned before each and every reservation, while many other listings in the city are not. You'll really appreciate staying at a clean and well taken care of space. • Communication. We have a 100% response rate for a reason. We respond to each and every guest message within just a few minutes, before and during your stay. • Arrival. We have a convenient 24/7 self-check-in system with free on-site parking that lets our guests have flexible check-in times, no matter how late it is at night. • Safety. Our home is located in an apartment community that has security cameras, is well-lit, and has an enclosed garage for private parking. • Location. The location we're in is a walker's paradise since most places you'll want to visit won't require a car. Morgan Street is as flat as a pancake, has ample sidewalk space, and is very bikeable. Our home is just a 5-minute walk away from the Convention Center. Walk Score is 84, Transit Score 65 and Bike Score 80. Everything you need to know about our home: • two spacious bedrooms each with a queen-sized bed • apple tv equipped with Netflix, HBO, Hulu, YouTube and cable in living room • super fast wifi, perfect for apple tv streaming • 1 bathroom • walk-in closet that'll hold all your suitcases, travel bags, and clothing • paid washer/dryer on the 2nd floor the hallway (not in our unit, shared with other residents) • black-out curtains over the large windows • fully stocked kitchen with the essential cookware, silverware, and dinnerware you'll need to dine-in • dining table • spacious living room that includes a queen-sized pull out sofa • laptop friendly workspace Please take a look at the photos in the listing to see our home and feel free to message us with any questions you may have regarding our rental. We typically respond in a few minutes. *Important. We require a photo of our guests' driver's license/state id during their stay. Please do not inquire or instant book if you cannot provide a photo of your driver's license/state id. More information regarding this standard procedure can be found in the "Other things to note" section. Get $40 in travel credit from Airbnb when you register for a new account using our referral link www.airbnb.com/c/abrahami164 This home is owned and operated by Trifecta Corporate Housing, Durham's premier corporate and vacation rental provider. Want to know more about us? Do an online search for Trifecta Corporate Housing and see why travelers choose us for their business and leisure travel needs. You cannot go wrong with this place. Fabulous communication from hosts from start to finish. Safe and unmatched convenient location if you want to experience downtown Durham. 2 Bedrooms, 1 Bath, only 1 mile from DPAC, 1.5 miles to Duke East Campus, 3 miles to Duke and the VA Hospitals. Two blocks from MotorCo, Fullstream and Durty Bull Breweries, The Pit Restaurant, Geer Street Garden, Cocoa Cinnamon and other downtown hot spots. Short walk to Durham Central Park, Farmers Market, YMCA, Restaurants, and much more! Open floor plan, includes granite counter-tops electric range, refrigerator, dishwasher, central heat and air, on-site laundry and parking. The unit was recently totally renovated, it’s well equipped with new stainless steel kitchen appliances and beautifully furnished. The living room and kitchen has an open concept. There is a four seat dining table in the spacious but cozy well equipped kitchen. The accommodations for this unit comprises of two bedrooms one full bath. One room has a queen bed and the other has two twin beds. The living room has a 50" smart TV and the master bedroom has a 43" smart TV which are connected to cable and Roku. There is also free wireless internet throughout the unit. There is onsite parking along with a laundry room and a large deck at the front of the property. A wonderful place in a great location. I’ll definitely be staying here when I visit again. What a great place. First floor, two bedrooms 1 bath with two TV's, a great kitchen, and just a great place to stay. There is a laundry room right next door to the unit that makes keeping things clean easy. But honestly if you are staying here you shouldn't stay inside, go explore the neighborhood. It is super close to the farmers market, numerous new "hip" places to eat (both inside and outside), mSushi (a must try!) , fitness places, and the amazing Tobacco Trail. I am a daily walker and every single day there were 20-50 people out walking both the trail and just around the neighborhood. The neighbors were all very friendly and cared a lot about their community, with gardens abounding and conversations between neighbors being a daily occurrence. I will be visiting again! The place is nice, the location is amazing and Dewitt is a fantastic host. However, the noise from the upstairs neighbors moving around is pretty loud which may or may not bother you depending upon how sensitive you are to these things. This apartment is in a great location and has everything you need! Dewitt is a great host and as super-responsive to any questions we had. The apartment as clean and welcoming on arrival and there were more than enough towels, bed linens, and kitchen staple to make our trip easy. You can hear a decent amount of the upstairs apartment’s living, but we solved that at night with white noise and it was never bothersome during the day. A short walk to coffee and restaurants and parking off street at the apartment - a great value and place that I’ll recommend to visitors.